The current market is seeing changing consumption patterns, both in what consumers buy, and how and where they buy it. This block looked at implications for the production and marketing of livestock products at all scales of production, from short supply-chains to collaborations with national retailers. Despite the success of independent retailers, organic red meat sales are still relatively lagging on supermarket shelves. What are the factors that lead to consistent success in organic red meat marketing? For this session, we brought together representatives from leading organic red meat businesses with proven track records, to share the secrets of their success. The first presentation by Liz Bowles based on Soil Association Market Reports clearly highlighted the mismatch supply/demand of organic food, with production lagging behind consumption growth. Consumption of organic red meat has also grown in the last year (against the decrease in non-organic red meat consumption), which suggests that opportunities for the organic red meat sector do exist. The presentation by Stuart Vile highlighted: 1) the decrease during 2011-2017 in cattle and sheep numbers as well as in abattoirs for both cattle and lamb 2) the Meadow Quality marketing characteristics and benefits in terms of supply chain logistics and on-farm consultation. The two last presentations by Tim Field and Anna Elliot were very much focused on the characteristics of Daylesford and Eversfield Organic farms, whose success is based on high quality production standards and a close connection with consumers. They both stressed the value and importance of using a number of alternative sale channels (e.g. on-farm sale, box scheme, on-line sale) as a marketing differentiation strategy and to target different consumer segments. Efficiency along the red meat supply chain (e.g. through regional networks of producers-abattoirs) is essential in order to hinder reduction of beef and lamb meat production. How can producers respond to changing diets? Diet change is rapidly happening, the latest Soil Association Organic Market Report 2018 confirms this also for organic consumers. Vegan, vegetarian and flexitarian diets are on the rise while sugar and meat, specially red meat, is under attack. However, is vegan the solution? Certainly not on its own as it allows pesticides, GM and requires increased import from overseas to the UK. Vegan organic is different and the UK (Iain Tolhurst and others) has been leading worldwide on the vegan organic (stock-free organic) standards development. However, within future flexitarian diets, how to make the case for organic livestock as part of a modern healthy organic diet? Marie-Hélène Schwoob (www.IDDRI.org) showed carbon emission benefits in their Europe wide TYFA (‘Ten Years for Agroecology in Europe’) scenario for extensification of livestock and pasture fed red meat. Intensive white meat production, ‘factory farming of poultry and pigs’ has to go and the remaining cereals can even be exported. 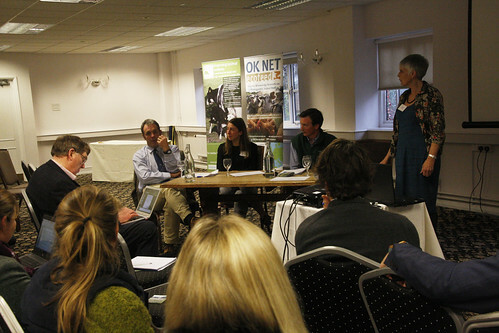 Liz Bowles (www.soilassociation.org) made the point that organic has a lot to offer in terms of high-welfare red meat but also organic white meat as a special treat in a flexitarian diet. Richard Young (www.sustainablefoodtrust.org) added to the case for grass fed and artisan meat highlighting the rapid decline of local abattoirs with its loss of short-distance stress-reducing transport and artisan butchery skills. He also made the point that, globally, plant alternatives like palm oil and soya could be more harmful then maintaining mixed farming and pasture based systems in Europe. The UK organic movement needs to be more active in the white red meet debate, showing benefits of organic grass feed red meat and moderate white meat consumption as part of a modern flexitarian diet. In the right amount meat (about half of current) can be part of a healthy UK diet. There are major issues with farmed fish and this can NOT be a substitute for organic meat (even if certified organic fish), overall conventional farmed fish needs to be looked at much more critically from a welfare, resource use and environmental perspective. Although, Tolly and others show ‘vegan organic’ works as a production system, it is currently only growing high-value vegetables. Grains and legumes crops (lupin, soya bean and tree nuts for protein) are not yet a practical alternative and more research is needed to get those systems going on a larger scale. Despite good case study examples in the UK there is generally still limited experience with more holistic systems mixed farming with agroforestry, nuts, silvio pasture etc. There is a severe loss of small-scale and “Mittelstand” type of farmers, who have the skills to make holistic systems a mainstream reality. More young female (and male) farmers are needed. Consumer dialogue is key, get them on board, listen and learn (convenience culture and lack of alternatives to supermarket is still a challenge). Particularly understand young consumers (16-25) and connect earlier e.g. in universities, this time is critical to form diet habits. Make much closer links with biodiversity community to make them see organic as the main and only model to get biodiversity back into the landscape. Make connection with RSPB, WWF… like in Germany to make an umbrella organisation (Hardy Vogtmann’s live work as an example). Greener UK delivering organic goods needs to be more like in Denmark, Germany and Austria - pro organic and behind a moderate 20% organic area aim or more, e.g. Austria already has 25% in 2018, and is heading towards aim of 100% in federal state of Burgenland. Need to be thinking bold! The UK cancer of so-called “sparing and sharing” thinking needs to be fixed - no other country in Europe has this narrative from the early 2000’s still alive in policy makers mindset. We need a ‘myth-busting’ report to highlight issues with vegan (without organic), industrial white meat and fish, and promote artisan and grass fed meat alternatives. A two-way dialog with consumers is important (Adrian Evans, Coventry University). It needs to be animal welfare quality oriented and open and also self-critical towards organic, like in www.organic-plus.net, learning from consumers and tacking them on board on the journey to 20%. More research on novel crops, more pulses, more nuts, larger scale stock-free production mixed with agroforestry , trees in hedges, and livestock (bring back mixed farming into arable).